Make posters for each song (or verse of a song) to review. *For mine, I cut pictures out of the Friend that represent the song or verse I wanted to review. I glued the pictures + the song title on the paper then slid it into a page protector. 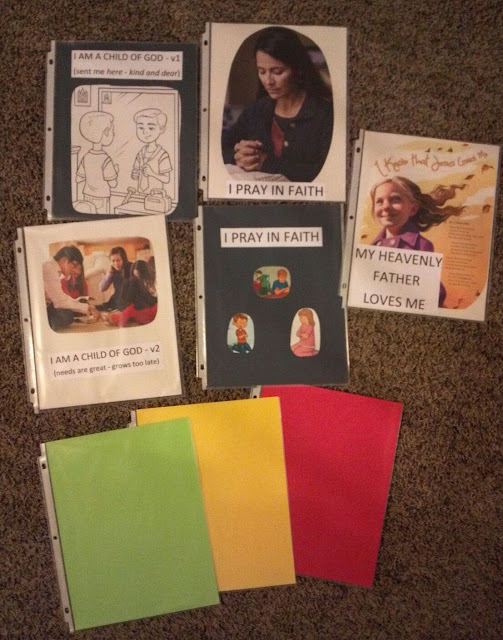 Put a red, a yellow and a green paper in page protectors. Put all the song posters on the board, facing the board. Set out the red, yellow and green papers on the table. Call a child up to pick a poster from the board. The child gets to control the Primary’s singing by which paper from the table they hold up. Keep switching as they sing. Green = GO AHEAD and sing the words, Yellow = hum, Red = STOP SINGING and think the words in your head. *If it gets out of hand and they start going nuts (I’m thinking my SR Primary might), I’ll pull out the Stop and Go String to gain control of the crowd. You never know, so I’ll be prepared just in case.